Democrats And The Press Begin To Turn On Obama | Virginia Right! It is taking it’s own sweet time, but the movement is undeniable. As the polls show a steady erosion of support for President Obama, so goes the press, and even his own party. President Bush spent 8 years with an antagonistic press chipping away at his presidency multiple times each day, save during the immediate aftermath of 9-11. Obama has enjoyed the opposite treatment from the press. He has been elevated to god status by the Mainstream Media and negative stories are suppressed. Still, it seems to be insufficient to keep the Obama presidency from unraveling. Everyone knows at this point that a malfunctioning TelePrompter will reduce this president to a blathering pile of inarticulate umms and ahhhs. And the only decisions he seems capable of making on the fly, without months of foot dragging, are those with racial overtones such as the incident involving Boston Professor Henry Gates. And we all know he embarrassed himself with that one. And he is also pretty quick to attack anyone that dare disagree with him: Rush Limbaugh, Glenn Beck or even an entire news organization like FoxNews. Typical Chicago politics – don’t deal with opposition in a rational way, through discussion and compromise, just destroy them. This is a man who refused to place his hand on his heart to recite the pledge of allegiance to the US Flag, but has no problem bowing to foreign leaders. As we near the completion of Obama’s first year as President, when you ask yourself if things are better than they were a year ago, it is difficult to say yes. Sure, the Stock Market has recovered some of the losses of a year ago, but the massive deficits Obama has run up with bailouts and “stimulus” payouts are hardly worth it. And when the only good news concerning employment is that the hemorrhaging of jobs has slowed, only to pick up again the next month. Things are so bad that even the short term Christmas Jobs have not made a dent in the unemployment rate. And after Christmas, most expect the massive losses to lead to more business failures and more unemployment. Clearly, Obama’s economic policies have made things worse. The press is beginning to lose their infatuation with the man. His Dictator-like hold on the Mainstream Media is slipping. The International image of Obama is tarnished and many are asking if they back the wrong horse. Most are disappointed. Even Helen Thomas jumped on White House efforts to control the Media, although she recently said she is thankful for a “black” president this Thanksgiving. Helen is clearly conflicted. But there remains a tendency for those smart-guy dumb mistakes. 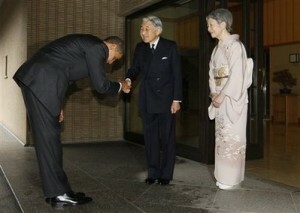 Obama’s recent bow to Japan’s emperor was a powerful cultural gesture to the Japanese. But that bow came in the context of earlier controversies over Obama’s smiling handshake with Venezuelan President Hugo Chavez and Obama’s bow to Saudi King Abdullah. Yes, we knew, or should have, during the campaign that the supposed idealist Obama had a bit of the Chicago cut-throat in him, but there was little sign that he could be as brutal and heedless of loyalty as he was in the Craig affair. An unexpected climate of fear emanates from the Obama White House. The incident underscored worries that several had held about the Obama White House for some time: that it was too tightly controlled and narrowly focused by the Chicago crowd; that it seemed from the outset to need an older, wiser head, someone with a bit more detachment. The current crowd displays a certain impulsiveness and vindictiveness that do it no good – as in the silly war-let on Fox News that it is now trying to back out of. Even if Craig was making a hash of his job – and there’s no independent evidence of this – it just wasn’t smart to treat someone widely held in such high respect in this manner; once again, the impulsiveness backfired. “I think there will be some disillusionment within his base,” said Paul Kawika Martin, political director for Peace Action, a grassroots organization, who added that thousands of activists are planning to protest following the president’s announcement. “We’re going to spank him for sending more troops,” he told FoxNews.com, adding that they may also “thank him” if he announces a quick exit strategy. The White House has said that the U.S. won’t be in Afghanistan for another eight or nine years. But that won’t satisfy liberals, Martin said. As we saw in Virginia and New Jersey in the 2009 elections, Obama has become as toxic as his predecessor. The Democrats successfully used President Bush’s negative numbers and the anger directed towards him and his party to capture the House and Senate, as well as the White House. But that tide has turned. While the press is still mostly in Obama’s pocket, they, too, will leave as Obama’s popularity sinks lower and lower. Chicago style “pay for play” and intimidation tactics grow old pretty fast. And as groups like Acorn are allowed to commit fraud and released by the likes of Jerry “Moonbeam” Brown and Eric Holder, the anger against this corrupt administration will grow. And as the Terrorists are granted rights and allowed to spew their hatred and venom at the US via the upcoming New York trials, the Obama Administration is hoping the flow of hatred from these terrorists will be against Bush and his policies will make Obama look good. But the people are already aware of the Chicago politics of destruction. Obama and Holders are not fooling anyone with the reasons behind the trials. And the backlash will grow. ← Howard Dean Says Republiucans Are Right On Health Care Bills!